150 children from Sipoteni village, Calarasi district will go to a new kindergarten, that was repaired by the Romanian Government. At the inauguration ceremony came Pavel Filip, who mentioned the importance of the investments in the modern conditions and the children's safety. He highlighted that the education is a priority for the Government. "We all should understand that a country is the citizens who live there. The ones who don't take care about education lose in vain their investments. 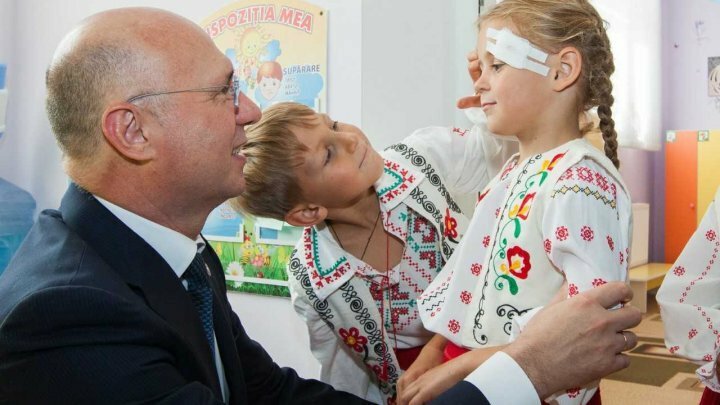 The Government works for children", said Pavel Filip, the Prime Minister of Moldova. The prime minister thanked the Romanian Government for their support, as they allocated nine million lei. Pavel Filip gave the Romanian Ambassador to Moldova a coin of the National Bank of Moldova. "We will evolve the great union, through common projects. Here I want to mention, the cooperation in energy field, infrastructure and education. I don't want to see a difference between the educational systems of our countries", said the prime minister. At his turn, Daniel Ionita showed that Romania is always ready to help Moldova and support it. The Romanian Government allocated 26 million Euro to repair 850 kindergartens.